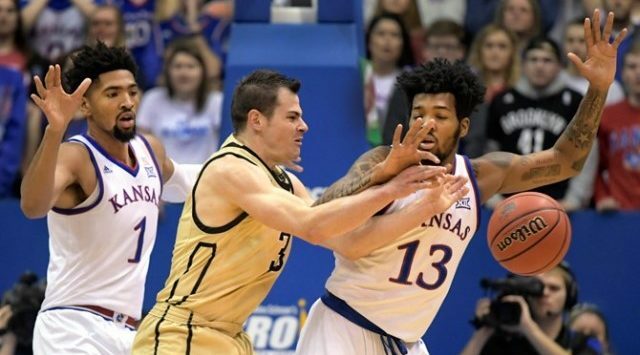 LAWRENCE, Kan. – The combo of freshman Devon Dotson, redshirt-junior Dedric Lawson, and a 27-0 second-half run proved to be too much for Wofford as the No. 2 Kansas Jayhawks claimed a 72-47 win over the Terriers Tuesday night inside Allen Fieldhouse. With Wofford entering the night averaging 11 3-pointers per game, stout Jayhawk defense helped close out on the perimeter, leading to the Terriers to a 3-of-23 clip from beyond the arc, a season low. With the victory, Kansas remained one of 11 teams in NCAA DI still without a loss this season, now boasting a 7-0 record. The Terriers suffered their third loss of 2018-19, now sitting at 6-3. It was an cold-shooting first half for both squads as the two teams combined to hit just three 3-pointers on a total of 19 attempts. Despite the cold touch from deep and an early injury to center Udoka Azubuike, the Jayhawks managed to take a 29-26 lead into the halftime locker room. This due to 18-combined points each from Lawson, Dotson and Marcus Garrett in the opening 20 minutes. Lawson connected on consecutive layups to begin the second-half and those were followed by a corner three from Dotson to help Kansas gain some separation early in the second frame, making it 38-32. After Wofford cut the lead back within two at the 11:15 mark, the Jayhawks didn’t look back. Kansas exploded on a 27-0 run over the next 8:49 to put the visitors away once and for all. The quick hands of Garrett and Dotson helped the Jayhawks get their hands in passing lanes for easy transition layups, sparking the team to nine steals on the night. In the blink of an eye, Dotson found his reliable big man, Lawson again for his 13th and 14th points of the night. That was followed up by a Quentin Grimes ally-oop in transition, making it 53-41 with 8:34 remaining. Lawson would score three more times in the paint while Grimes added a late three-pointer, capping a 30-7 KU spurt to close the game after Wofford came within two points. Lawson showed his consistency and experience with 20 points and eight rebounds on the night, shooting an impressive 10-of-17 from the field. Dotson continued his hot streak as he finished with 16 points on 6-of-9 shooting. He also dished out three assists. Grimes bounced back after some quiet outings with 14 points. KU closed out the game holding the Terriers to 26.2 percent (17-65) shooting from the field, which included a 5-of-26 clip (19.2 percent) from beyond the 3-point arc. Kansas also outscored Wofford in the paint by 30 points with a 46-16 edge.